Once more to go a-roving, in the Bold Privateer. Then to roam the wild ocean, in the Bold Privateer. I must now go on board of the Bold Privateer. For I dread to see you leaving, in the Bold Privateer. And will soon let them know, she’s the Bold Privateer. And send you safe back, in the Bold Privateer. And go no more a-roving, in the Bold Privateer. 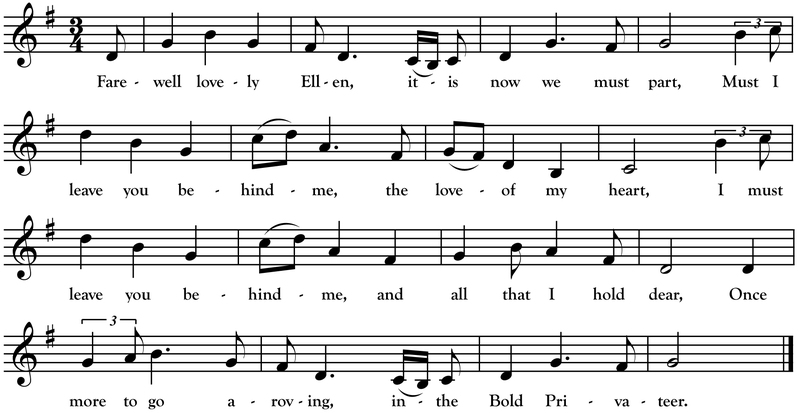 On Februray 20th, 1927, the New York Times “Queries and Answers” section ran a request from one Joseph F. McGinnis for a full text of the above ballad to which McGinnis knew the melody but only the first two verses. McGinnis (featured in last month’s Northwoods Songs) was born in Kingston, Ontario and learned songs as a sailor on the Great Lakes before settling in New York City. McGinnis’s New York Times request was answered by none other than renowned Derry song collector Sam Henry. Henry supplied McGinnis with the missing verses and went on to correspond with McGinnis over the next few years. Henry even printed two songs contributed by McGinnis (“The Deserter” and “The ‘Crummy’ Cow”) in his “Songs of the People” column that has since been published in book form and is regarded as one of the finest collections of Irish traditional song in the English language. The above text comes from a typescript prepared by McGinnis for “Songs of the Dogwatch”—his own collection of songs which was never published. The above melody is also based on the transcription that appears in the McGinnis typescript but I have taken liberties with rhythm and key signature to conform the air to what I believe is more probable.